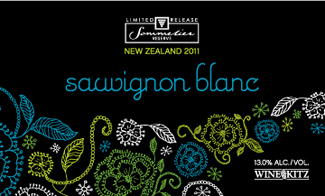 Wine Cellar 2011 Limited Release – pre-order your New Zealand Sauvignon Blanc before Jan. 13th! New Zealand grows some of the world’s most southerly grapes, so hopefully our second Wine Cellar 2011 Limited Release will have you dreaming of warm weather! Our New Zealand Sauvignon Blanc features a fresh clean aroma of grapefruit, gooseberry, grass and fresh herbs. This refreshing, light to medium-bodied wine is fabulous for everyday enjoyment, and requires no aging – in fact, it is at its best when served while young and fresh. As with all of our Limited Release wines, quantities are limited and kits are available by pre-order only. To avoid disappointment, call us at (905) 509 – 6748 or email us today to pre-order your kits. Help us choose our new wedding ad!